A group that sought to increase Michigan’s minimum wage to $10.10 per hour effectively ended its ballot campaign Friday. The Raise Michigan Coalition said Friday it would not wage a legal battle to get on the November ballot after the Board of State Canvassers rejected the group’s petitions last week because they contained too many duplicate signatures. And to think that my spineless squish and his pandering Democrat-lite friends capitulated to these losers. Gotta admit, they played the saps in the Michigan republican party like a finely tuned instrument and gotten exactly what they originally set out to do. Remember, these shemps didn't even agree to a dollar amount until it became a running joke during interviews with the media. 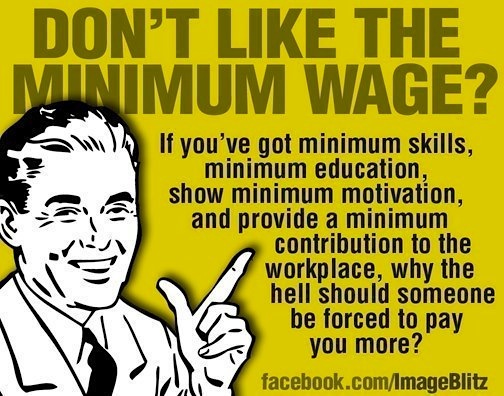 They wanted a minimum wage hike and they got one. And then next year, they'll be at it again complaining about how it is difficult to raise a family of whatever on what they are making doing as little as possible.